Lining the coast of France at Normandy are magnificent white cliffs. Carved into those cliffs by countless waves crashing into them over many millennia are multiple arches. 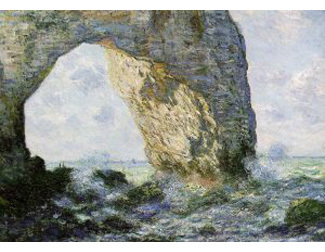 Monet and many other painters have found themselves drawn to painting this striking coastline. The painting to the right was produced out of the mind of Monet. We could say that the painting is the product of design though mediated by brush, paint and muscle movements. But what of the arch itself? Is it simply shaped by chance events playing out over eons of time? Or is it the result of a mind. A mind of a far more accomplished Creator than Monet who while a creator himself had a far more limited pallet of options with which to work? Is there even a distinction between these possibilities? 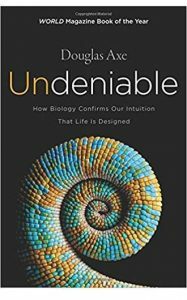 Douglas Axe, in his book, Undeniable, argues that human beings are endowed with an intuitive sense that some parts—specifically the living things—of the world we live in are the product of a designer. He calls this uniquely human characteristic our Universal Design Intuition (hereafter referred to as UDI). One definition of UDI provided states that “tasks that we would need knowledge to accomplish can only be accomplished by someone who has that knowledge” (20). Maybe even more simply this UDI expresses the idea that “we share the intuition that life can’t be an accident.” Furthermore, Axe postulates that because this intuition is something we all share, we only need look to “common sense” or “common science” to realize the truth of a designer. Axe has provided a great deal of thought provoking material in his book. Beyond the criticisms I have of the science presented (e.g., his use of probability statistics and misunderstanding of the process of natural selection), I found myself returning to the same questions: How can we know that we have a UDI and if we do have one, has our UDI always spoken the same language through time? If not, is it really universal? Just how accurate is our universal design intuition? Can our intuition take us down side alleys and lead us away from the truth? And critically, how would we know if we were going down a blind alley if we believe our intuition cannot be wrong and we don’t agree how to test it? Before we delve into a few of these questions let me first affirm I am sympathetic to the desire of Axe to provide an answer to “the big question: to what or to whom do we owe our existence?” My answer to this question does not differ from that of Axe. I desire that God be properly identified and more importantly worshiped as the Creator and sustainer of all things. Does Our UDI Behave the Same Way through All Times and across Populations? If one seeks to prove the existence of designer via a proposition that our intuition or common sense universally leads humans to identify the products of intelligent design when we see them, we might expect that such an intuition should be shared not just by all humans alive today but also all who have lived in the past. This raises an interesting question: How much functional coherence must be observed before we can infer design and proclaim that we know that something is the direct product of a supernaturally intervening designer vs. the product of “natural” mechanisms, and how can such “functional coherence” be measured? We are given very little guidance in this area. Many times as I read the book I felt the unstated answer was “you will know it when you see it.” After all, isn’t that what the UDI is all about, using our inbuilt—designed!—intuition to recognize functional coherence that meets our internally-set bar that establishes those things that just can’t happen by chance? But is there a universal bar or threshold that must be met to identify design or can the threshold of what we deem necessary complexity differ among individuals? This brings me back to the UDI as a human characteristic through time and across populations. Across all populations shouldn’t we expect that the level of knowledge that a person has will influence whether they are able to mathematically calculate the odds of functional coherence resulting from normal providential laws vs supernatural design intervention? It seems self-evident, dare I say intuitive, that even common sense and especially our “common science” sense varies greatly among individuals since common sense is influenced by personal knowledge and experience. Consider that many great scientific discoveries are great discoveries precisely because they defy common sense (e.g., plate tectonics, quantum mechanics, general and special relativity, gravity, deep time). I find that I am constantly working against common sense in the classroom as I explain many biological concepts (e.g., non-identical twins can have markedly different appearances, even expressing many characteristics not observed in their parents). With respect to Axe’s use of probability statistics to invoke design, consider that there is abundant evidence that humans lack a strong intuitive feel for either large numbers or long times for us to rely on common sense. How then can we presume to prove design through intuition that uses probabilistic arguments to make us aware of whenI expect that we could demonstrate over and over again that our ability to intuit design is often incorrect because our common sense is apt to lead us astray rather than lead us to true knowledge. we are witnessing impossible events when at best we are usually confused by large numbers and long periods of time? It is precisely because of our problems with large numbers that we should not be surprised that Axe’s design argument is powerful even if it isn’t accurate. For example, consider the common response from theists of all types, every time an earthquake occurs and days later a small child is pulled from the rubble: “It’s a miracle!” Our common sense leads us to conclude that God has directly bypassed his normal providential ruling of the world partly because our internal odds calculator erroneously suggests that what we have witnessed is not possible. I expect that we could demonstrate over and over again that our ability to intuit design is often incorrect because our common sense is apt to lead us astray rather than lead us to true knowledge. The question becomes, how does one test intuition for accuracy and how does one decide whose intuition is correct if two individuals intuit two different answers? Axe appears to suggest that measuring probabilities which point us toward “fantastically improbable and therefore physically impossible” events could be a scientific test of detecting design. But his reliance on suspect statistics to perform that test is not convincing—or we could say is not likely to be intuitive to most people and thus not part of our presumed UDI. Has Our UDI Always Produced the Same Results over Time? On the face of it, Axe might have drawn on history to find support for his UDI. I think we could all agree that through all time and in all cultures, people have always believed that the world is something more than the simple product of mindless chance. This would seem to be powerful evidence of a UDI is present in all of us. Consider that 3000 years ago no person would question that God was responsible for everything that happened in their world. Importantly, the design inference was not applied selectively but rather applied to everything. 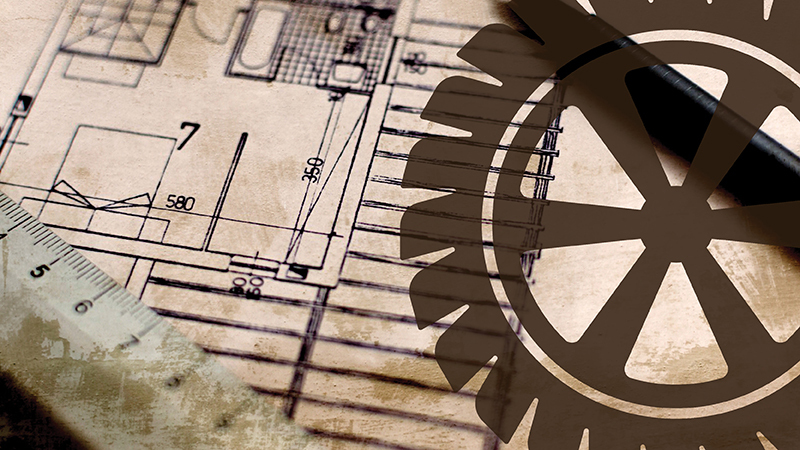 Design was common sense; furthermore, it was the common science of the times. The question wasn’t whether God was responsible for any particular thing or action but rather which God or designer was responsible. “How” said deity was responsible was not really a question that was asked or answered with much rigor (though Jesus did note in Matt. 16:2-3 that observation of natural phenomena could be used to formulate predictions). For example, the rain fell because God made it rain. What other conclusion would anyone have possibly come to? Interestingly, Axe appears to come to a different conclusion. He states regarding rain that “sometimes the total effect is just a simple sum of the momentary effects. A little rain on the street produces small puddles, then bigger ones if it continues…. We aren’t left with the impression that the rain or the clouds intended to close the street” (67). LaterThe ANE people seemed to have a UDI that was tuned to a very different frequency than the one that Axe says we all have today. he states, “rain happens, but life doesn’t just happen.” But that is not what the Israelites or even their neighbors in the ancient Near East (ANE) thought. Rain didn’t “just happen.” Rather, if a flood happened it was the intention of God that that rain should have that very effect. Nothing happened that was “just a simple sum of the momentary effects.” The ANE people seemed to have a UDI that was tuned to a very different frequency than the one that Axe says we all have today. Today, Axe, along with most Christians, is comfortable attributing the formation of rain to “natural” means rather than a direct act (God bypassing scientifically describable processes) of God as designer (as opposed to God the ruler, sustainer and upholder of his creation). Axe leaves the entirety of the non-living world out of the design argument despite it being an integral part of the ancient intuition. Despite this apparent change in our intuition, Axe believes we all retain a UDI with respect to the design of living things which is truly universal and unchanging through time. That UDI should, if not suppressed by anti-theist forces, drive us to believe that God directly fashioned, as a complete whole with no common ancestors, each species or subspecies or genus or family of living things (I must add that I am utterly lost with respect to where Axe believes the boundaries of designed things are to be found). Returning to the geological imagery from the beginning, let’s consider another arch—this one is in Utah. We might ask, is Corona Arch the result of a designer or not? Axe seems to take no issue with natural physical laws creating things because these objects are not expressing some sort of will, or an intent to be “who they are.” But let’s apply the probability argument that Axe uses to identify design in living systems and ask, what are the odds that Corona Arch should exist today? If we were to calculate the probability of each of the events including the deposition of trillions of particles of sand in many layers over millions of years followed by slow processes of erosion in just the right climate occurring in the specific location of Corona Arch, our calculation would lead to a number that our intuition would tell us is “fantastically improbable and therefore physically impossible.” But what about the odds that any arches would be produced anywhere in North America? Given that rock of different densities and erosive capacity are produced on grand scales over time and that erosion should occur over vast areas under many different conditions, the chances that an arch, or even many arches, should appear from these “inanimate” materials and physical conditions are quite good. In fact, the odds that at least one arch should exist is likely so large that it would be unreasonable to believe that arches should not exist. So the existence of any particular arch could be viewed as “physically impossible,” yet some of these physically impossible arches must exist. Let’s not forget that God is the author of all things and should He desire to create arches, He could create those arches through ordinary means even if never fully understood by us. 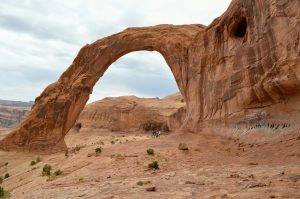 Irrespective of its exact origin, I can still gaze up at Corona Arch and be filled with wonder that God made that arch. I don’t need to calculate the odds of its existence to know it is God’s handiwork. My reflection on Corona Arch may appear to confirm some aspects of Axe’s UDI. In a way it does, but only in a much broader sense than Axe intends because it confirms that it is possible to understand all of creation as being part ofHere we must ask an important question; even if we were to provide a scientific test to prove miraculous design—something I don’t think is achieved in this book—would this lead the unbeliever to the designer? God’s plan and design. Axe wishes to employ his UDI to locate elements—living creatures alone—that prove God’s immediate design plan which will prevent “atheistic scientists” from maintaining their naturalistic philosophy. I ascribe to a much broader understanding of design, one that would have been much more familiar to the biblical authors. Here we must ask an important question; even if we were to provide a scientific test to prove miraculous design—something I don’t think is achieved in this book—would this lead the unbeliever to the designer? Must we find this evidence of miraculous intervention so that “atheist scientists” will be “without excuse?” (Rom. 1:20). Do we require more evidence of God’s action in this world than we already have recorded for us in the Bible? This search for one more miracle that will open the eyes of the unbeliever to a Creator seems to be akin to what the rich man in Luke 16 hoped to achieve. The rich man asks Abraham to send Lazarus to his family because if a dead man—a miraculous appearance in their eyes—should go to them they would surely repent. Abraham responds in v.31, “If they do not listen to Moses and the Prophets, they will not be convinced even if someone rises from the dead.” Finding more examples of miracles in Earth’s history sounds like apologetic gold, but it may be fool’s gold if we think that it will prove God as Creator apart from His word. My Reformed Protestant roots may be showing here, but within that tradition we understand that everyone has an innate understanding that there is a Creator (designer if you wish) but only those who accept God’s call can recognize the true identity of the Creator and give Him true credit. We don’t need to look to events that occurred two billion years ago, calculate the odds of those events for which we don’t and can’t fully understand all the variables, and use those statistics to convince ourselves that there is a Creator and sustainer of the universe. The Creator is undeniable but will be denied nevertheless and regardless of how much new evidence we produce for his existence. Finally, while standing under Corona Arch I am reminded that God’s design is not finished. I also know that if at that moment it should fall and kill me that that this also was part of God’s plan. Again, not because I have calculated the odds of that happening are infinitesimal and therefore God must have caused that fall at that moment through direct suspension of normal providence, but rather because of his infinite wisdom and foresight of all things. For me this is what is undeniable—not because of probability statistics or my own intuition—but because of the Holy Spirit that undeniably dwells within me. 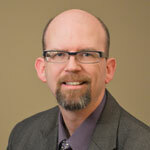 R. Joel Duff (PhD University of Tennessee) is a Professor of Biology at The University of Akron. His research focuses on understanding biological diversity by examining differences in DNA sequences and genome structure. He is an active writer (TheNaturalHistorian.com) and speaker (Solid Rock Lectures and BioLogos) exploring science and Christian faith. He is an avid nature photographer and enjoys exploring God’s creation with his wife and five children.